I am excited to be the queen bee this month in the Stash Sew-ciety Bee and hope my bee mates will like making the blocks I have chosen. My friend, Trudi Wood, in England, designed this quilt for the Sizzix Blog and I fell in love with it. She calls it, "curves, NOT Curves" and I am sure you can see why. The two block quilt gives the illusion of curves. I have done a mock up in PhotoShop Elements (a little off kilter) using the two blocks that I made as practice blocks. Even though Trudi designed it to be made using the Sizzix die cutter machine I have figured out the pattern and with Trudi's permission, I am asking the Stash Sew-ciety bee to make one of each block. 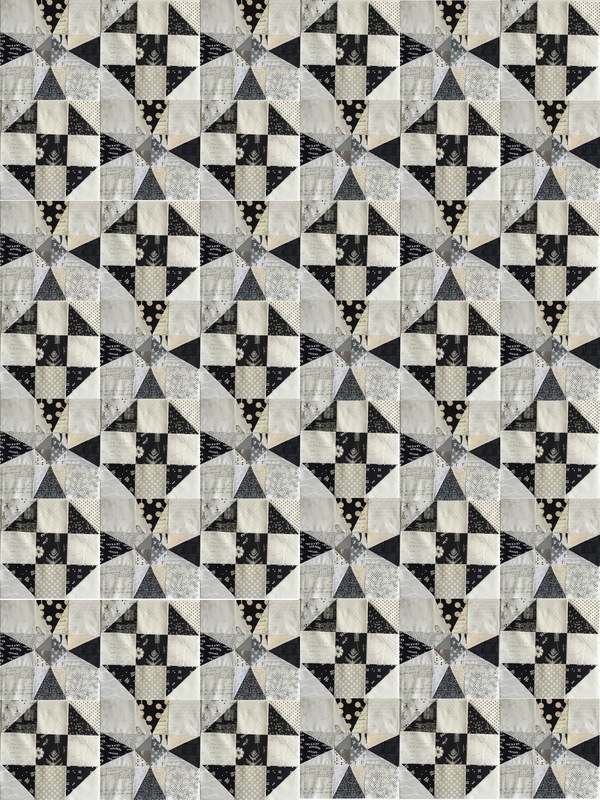 This will be a black, white, cream and grey quilt. Thanks Trudi for allowing me to recreate this as a paper pieced and traditionally pieced quilt. I love the optical illusion of curves. Fabric colors (or non-colors) area great.